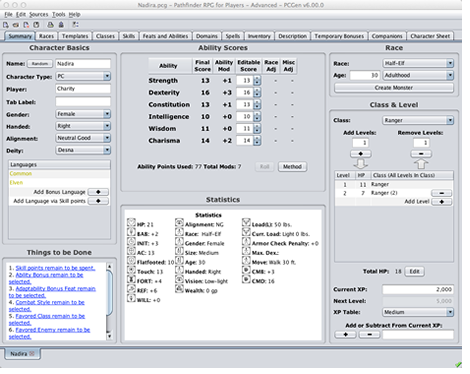 PCGen helps you build characters for role-playing games like Pathfinder and D&D. It's like a character sheet that handles all the tricky and tedious parts of building characters. You can use it to build one character for yourself, or to keep track of a dozen NPCs for a game world. PCGen is a volunteer project, so it's free of charge and always will be. PCGen helps you build characters fast, so you can get back to playing your game. PCGen knows the rules, so it keeps you from making mistakes. PCGen helps you track all the details – classes, feats, spells, and everything else. PCGen does the math of adding bonuses – even when they get complicated! So you can jump in and start creating characters right away.